I am new to the slow cooker revelation and made my first ever batch of homemade lentil soup the other day. Pippa wanted to know the recipe so here it is. Add the Ham or stock, lentils, onions, carrots and to the slow cooker. Next add in the water. 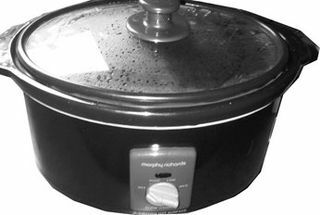 Put the lid on the slow cooker and cook on high for one hour. Turn down to low after this and cook for a further 6-8 hours. You can serve chunky with some bread or blend for that smoother finish. This will make a huge amount, which will be very think and you may need to add some water before reheating. Make a great and healthy lunch. I have to say, this was delicious, the boys both loved it. Oooh sounds yummy! I’m looking for some ideas and this one seems extra tasty.